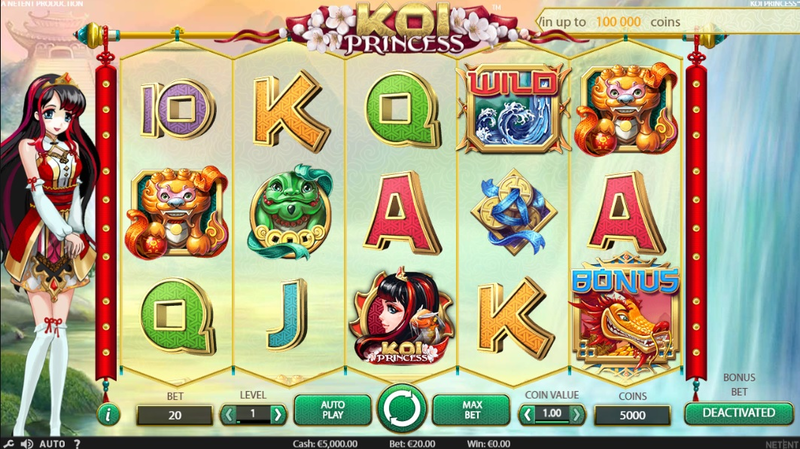 At first sight Koi Princess may seem to be a pretty complicated slot to try. But, actually, it still has a lot of advantages. Thus, the game offers four random and four bonus features, and some of them can be really profitable. For example, the Bonus Wheel can multiply your stake by 1000 times! Koi Princess was created by NetEnt. The slot has 5 reels and 20 paylines. Actually, the name of this game speaks for itself - the paytable looks like a screenshot from an anime cartoon. Well, the overall design is not extremely outstanding, but those players who like Eastern culture will definitely appreciate it. The wild symbol looks like a wave, and there is also a word “Wild” written on the icon. The scatter symbol is the princess in person. Frankly speaking, the rules of Koi Princess slot are a bit complicated - there are a lot of things to keep in mind! But no worries, we are going to review all the important details. So, let’s begin with the wild symbols. As usually, they substitute for anything except the Scatters. By the way, two wild symbols will bring you 4 coins, three - 100, four - 300 and, finally, five - 500. And the highest payout for collecting princesses (those who are the scatters) are 400 coins. “Here is a really interesting feature of this slot - you have an access to Bonus Bet function”. You can activate it for every spin. And if you do it, the cost of every spin will be doubled. Moreover, you will have more chances to get a random feature. Yeah, now it’s time to take a look at the random features. Don’t get scared if the paytable suddenly shrinks a little bit! This means that you are awarded with one of the random thingies. You will see 3 carps, and you will have to choose one of them. The fish you chose hides one of four random features. The first option is the 5-Hit feature. It will provide with a free spin with a guaranteed winning. Yeah, after you spin, you get 5 identical symbols. But the symbol and the line will be random. But okay, here is the second option - the Random Wild feature. It will allow you to spin the slot for free (but only once! ), and provide you with 4 - 9 wild symbols. Obviously, their location on the reels will be absolutely random. The third feature - the Wild Reels. This means that during the next spin 2 - 5 reels of the slot will be completely covered with wild icons. And, finally, the Bonus Activation feature. It will give you one free spin and an opportunity to activate one of the bonus features. You see, there are a lot of things to keep in mind! So, let’s now talk a bit about the bonus features. The first bonus is called Sure Win Free Spins. It will give you 10 free spins, and the amount you win in every new spin is at least the highest winning which you gained during the previous spins. But this cool feature doesn’t relate to the first spin. Okay, the second bonus - Wild Reels Free Spins. It will provide you with 10 free spins and from 1 to 5 reels completely covered with the Wilds. Here is another bonus - Coin Win. This one is simple - you just get an instant coin win. The amount is your current bet multiplied by a random multiplier, which is from x15 to x30. And the last option - Bonus Wheel. This one is pretty cool - you win some coins and get an opportunity to trigger two more Bonus features. Yeah, we know, Koi Princess slot may seem to be kind of complicated, but, actually, it’s worth trying. It has a pretty stylish design, and it can bring you some winnings. For instance, the Bonus Wheel can bring you a really nice jackpot - from 25 to 1000 times your stake. Does it sound attractive? Yes? Then you are welcome to follow this link.